Join the Punk Rock Sewing Circle in commemorating the 40th Anniversary of Punk with SF Punk Renaissance (September 20-27, 2015) a weeklong festival of iconic punk events celebrating old school music, art, and culture. We have the venues, artists, films, bands; our DIY spirit is as strong as ever. Our only stumbling block is financial. We’ve spent 7 months planning, sweated blood, gnashed our teeth, and taken our money out from under the mattresses. We are attempting to defray the cost of the festival. Contribute towards our $15,000 goal and help put SF punk history on the map with SF Punk Renaissance 2015. Here is our Go Fund Me link. WHY DO WE NEED HELP? We’re a barebones volunteer organization who sticks to our roots. Our events are done DIY style and showcase the best of San Francisco early punk. San Francisco is one of the most expensive cities in the country and everything from venue rentals to food and equipment costs reflect that reality. Ticket sales only meet a small percentage of our costs; if tickets were priced to reflect the costs they would be unaffordable to many members of the punk community. All funds donated through GFM will help cover overhead-venue, sound, and equipment rentals, stage construction and band stipends. The venues are lined up, the bands confirmed, and the art is being framed. We’ve done the planning, the work, and taken our money out from under the mattresses but we’re still running short of funds. We can’t do it without you. Help us make SF Punk Renaissance 2015 a reality by contributing to our campaign and help us keep our history on the map. WHAT IS SF PUNK RENAISSANCE? 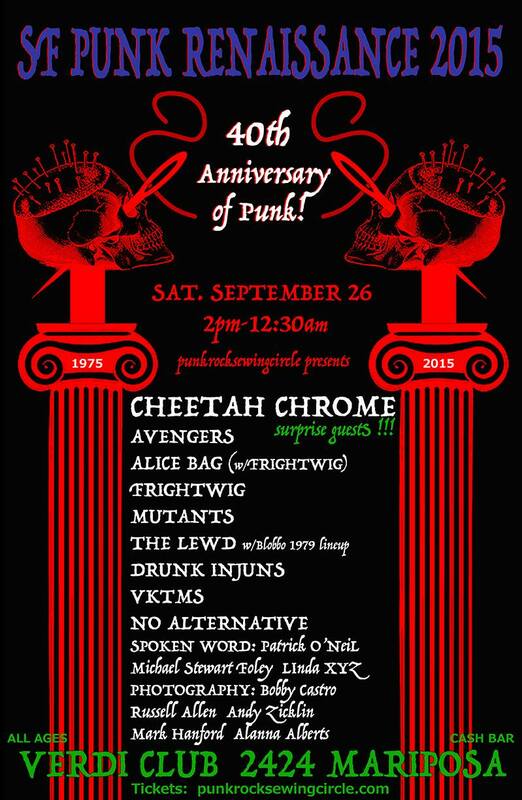 From September 20-27, 2015 we’re celebrating the 40th Anniversary of Punk with SF Punk Renaissance, a weeklong festival of old school style punk events. From London to San Francisco and beyond, punk was a revolution that changed history forever. Despite our strong scene, San Francisco has never received the recognition it deserved in the histories of the era despite being on the cutting edge in all fields. Forty years ago we defied convention, and with our deep DIY ethos changed the world of fashion, art, and music forever. We built a Community. Forty years later, we’re still defying convention, still creating, and still making music. SF Punk Renaissance will showcase early SF punk photography, film, music, and spoken word. Gallery exhibits feature iconic early punk photo images while film screenings highlight rare footage from our early history, including recently discovered 8 mm films. Panels provide an opportunity for dynamic reflection while the live musical events share the type of music that brought us all together. SF Punk Renaissance is a celebration of Punk -the heart of our community, our Past and our Present.